Described as being for teen girls, “The Devoted Life” works just as well for adult women. 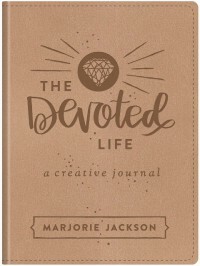 This is the first “creative devotional journal” that I have ever explored, and it is very neat! The book itself is slim, which is handy for carrying in a purse or bag, and the imitation leather gives the book a more forgiving binding that allows for coloring and writing inside without too much hassle. Normally I would prefer a spiral-bound setup with this type of interactive book, but the imitation leather really does work quite well here. There is even a pink ribbon bookmark attached to the binding. Each section title appears in hand-drawn bubble letters, along with occasional small illustrations, to color; as such, the text is somewhat difficult to read, but I imagine that it would be easier once the letters are colored. Each devotional consists of a Bible verse followed by a one-page commentary and three Scriptures for further study. There are five journal prompts related to the devotional, and out of these, at least one or two would be good for groups as well as individual reflection. The topics are easy to relate to and bring up common issues that everyone has dealt with at one time or another. Following the prompts, the Bible verse from the beginning of the devotional is drawn out for coloring. At the end of the book there are 9 pages with simple borders to “Create Your Own Hand-Lettered Scripture Art”. Just flipping through the book, it might seem a bit bland, but it lacks color because that’s where the reader’s creativity comes into play! What a fun, meaningful journal-devotional combination!